"ONE OF THE MOST DISTINCTIVE CREATIVE FORCES IN LATIN MUSIC TODAY"
The latest review of "VOZ" Parlez- vous Français? Luis Munoz, c’est toujours le travail bien fait, le produit de qualité. Le batteur a réuni du beau monde pour cet enregistrement, où l’on remarque clairement sa direction précise et rigoureuse sur ses cymbales, éléments fondateurs de son jeu. On trouve dans cet album la richesse de la texture sonore du vocale de Claudia Acuna ainsi que l’inventivité du phrasé et l’essence technique désarmante de tous les musiciens. La musique sonne juste au bénéfice de la mélodie et les morceaux tempo majoritairement medium laissent exprimer une sensibilité latine sur des thèmes plutôt convaincants. L’ensemble déploie une véritable unité mais aussi l’idée que chacun de ses sections développe un thème unique, éclairer par un traitement spécifique, toujours explicite pour l’auditeur. Les 9 chansons sonnent de façon somptueuse, fonctionnant par étage sonore, souple et élastique. Et le lyrique met en place des liens toujours renouvelés avec excellence. "Voz" repose sur la symbiose, un principe appliqué à tous les paramètres car la voix et l’interprétation se confondent à l’audition, les distinguos entre une situation vocaliste/ accompagnateur et celle du jeu collectif souvent facile à établir. L’ensemble de l’album a une dimension organique, s’imposant avec une force suffisamment rare pour avancer sur les 10 morceaux qui vont marquer les esprits. Dès son deuxième opus, le groupe Munoz s’impose comme un jalon important, notamment pour le son de l’ensemble. "Voz" se caractérise par la prouesse technique avec des morceaux véritablement structurés et développés, composés par un groupe soudé avec des talents individuels indiscutables au point de nous émouvoir. Du Latin Jazz revigorant et jouissif mais au-delà de cela, de l’art et une conception orchestrale de la musique où l’harmonie tissée entre la voix et les instruments est remarquable. A consommer sans modération. Percussionist/keyboardist Luis Muñoz has produced an elegant album of nine original songs. You wouldn't think this was a drummer's album, though, because of his sparing use of his own instrument, with the accent on almost chamber music settings. Indeed, he does not even play on either ""Journey of Saint Augustine" (a lovely instrumental with bass, guitar and trumpet only), nor the final three songs. The opening track "Preludio y Fin" is a case in point. Magos Herrera's soft, breathy voice, along with Adam Asarnow's delicate piano, is all that's heard for the first minute-and-a-half. It's not until "Pasión," the fifth song, that there's more overt rhythmic work, a lilting Brazilian piece with Téka Penterich singing. One song, the lilting "Quisiera," features Chilean singer Claudia Acuña, perhaps the best known of the three singers here. The album closes with the delicate "Amanecer Luminosa." with Herrera singing the poetry of Osvaldo Sauma (National Poetry Award Winner 2014 in Costa Rica), set to music by Muñoz. This is an album of beauty and spirit. I wish there had been a lyric sheet translating the songs into English, but their emotional content shines through my language barrier. Looking at the credits, Luis Muñoz’s gorgeous new album “Voz” seems like it’s all over the map. And it is, in the best possible way. It is a project overstuffed with an international array of artists who have each made memorable recordings of their own, but “Voz” never suffers from a lack of focus. A multi-instrumentalist who plays piano, percussion, melodica and drums, Muñoz guides the proceedings carefully as a composer and arranger. He doesn’t even play on every track, but his generous spirit suffuses the music from beginning to end. As the title suggests, “Voz” is a project focusing on the human voice, and what voices! Muñoz showcases three remarkable women from across Latin America, creating bespoke compositions and arrangements to fit the contours of their unmistakable sounds. Like so many Latin American musicians who have settled in the United States in recent decades, Santa Barbara-based Muñoz has created a highly personal style that could be called Latin jazz, though it has little to do with the Afro-Cuban/jazz synthesis forged by Dizzy Gillespie, Chano Pozo and Mario Bauza in the 1940s. For players, Muñoz draws on a cast of longtime collaborators, including pianist Adam Asarnow, bassist Brendan Statom and guitarist Daniel Zimmerman. Each track features different instrumentation. On “Argentina,” an elegant setting for a lyric by Nicaraguan singer/songwriter Luis Enrique Mejía, Herrera engages in a hip-swaying dance with the flugelhorn of Jonathan Dane, whose self-possessed horn work provides the album with another striking voice. Born and raised in Costa Rica, where he graduated from the National Conservatory, Muñoz moved to California in the mid-1970s to study music at UC Santa Barbara. He’s been there ever since, creating music for film, dance and theater, while documenting his own compositions on a series of acclaimed albums. “Voz” is his most personal project yet, one that often finds him reaching back to his Central American roots for inspiration. “Quisiera” is a collaboration with multi-instrumentalist Jaime Gamboa, a founding member of the great Costa Rican band Malpais. A lament for lost love, the song features a double dose of soul with vocals by São Paulo-raised, Southern California-based Téka Penteriche and Chile’s Claudia Acuña, a longtime force on the New York scene. What’s particularly impressive about “Voz” is Muñoz’s restraint and exquisite taste. On paper the album looks like it was conceived by a kid in a candy store, but his spacious orchestrations and measured tempos give the music plenty of room to breathe, even on the most intricately constructed tracks. He leaves you wanting to hear more from every singer, particularly Téka, who shines on the undulating samba “Pasion,” which features a lyric by Panamanian songwriter Romulo Castro (best known for his work with Ruben Blades). The 86-year-old jazz great Ron Kalina provides gleaming counterpoint on chromatic harmonica. The album closes with the most intimate-sounding track, “Amanecer Luminoso,” or “Luminous Dawn,” a brief setting for a poem by Costa Rican literary lion Osvaldo Sauma featuring Magos Herrera, backed only by pianist Adam Asarnow. Muñoz doesn’t play on the piece, but as an artist attuned to the ephemeral nature of life and love, his voice comes through every track on “Voz,” a gossamer dreamscape of an album. 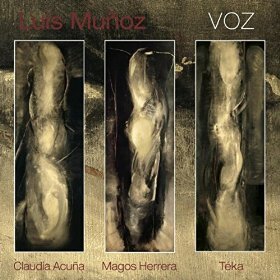 LUIZ MUÑOZ LATEST CD “VOZ’ IS A BEAUTIFULLY CRAFTED WORK! There are few – very few – drummers playing music today who see music in four dimensions; the three we know and the fourth – that ethereal dimension or spirit world. Listening to Voz, this extra-special record by Luis Muñoz, you will not help wondering how the drummer does it. It is clear that he ‘sees’ music as something sculpted, an edifice built but not a geometric one, or at least not one designed by a ruler and a set square. Rather his music is shaped by a French curve, it would seem; sensuous, alive and undulating with heart and soul and spirit – a cadaverous shape that sighs and breathes. The fact that Luis Muñoz has trained as an architect might have something to do with it but I rather posit that he must have been born a shaman in some otherworldly life to be able to divine music in these terms. Add to that the fact that Luis Muñoz plays his instruments in a painterly manner and you have this recorded ‘mural’ as a result. The drummer not only understands his own instrument in terms of the tone colours of its tuned peripherals and therefore the powerful extent of the colour palette he has at hand but because Mr. Muñoz thinks like a painter – a colourist – that he is able to bend other instruments to his command. This might be the only manner in which to explain the interpretative risks he takes to ensure that he can draw from any instrument – including here, the human voice – articulation that is more abstract, soft-edged and generally imitate an expansive, almost endless musical universe. 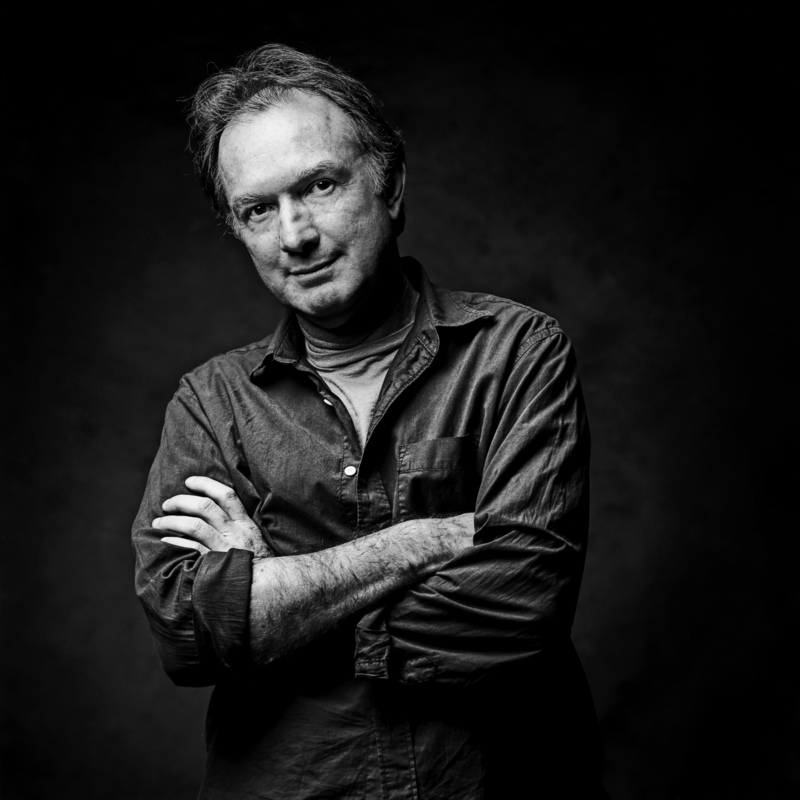 Using these multilateral voices thus Luis Muñoz is able to imagine and give birth to a unique double-choir juxtaposition of lyric and free contrapuntal ‘rhapsody’ to produce throughout contemplative warmth. It is, of course, a stroke of genius that Luis Muñoz should have chosen Magos Herrera, Teka Pentariche and Claudia Acuña and a heavenly host of other backing vocalists to realise his music. Indeed the leading ladies deliver an almost surreal ride through which brilliant images and visions emerge. Throughout the vocal masterpieces visceral scenes are offset against an ethereal quest for musical redemption. Listen to “Manantial”, “Argentina” and “Quisiera” and you are sure to be mesmerised by the volley of declamation and rich illusion over the short and long space in music time that Luis Muñoz, all this in contrasting tableaux of ever-surprising emotional impact. The vocalists deliver in ways that will leave the listener gasping. As you would imagine, surprises abound – some of which take a little getting used to. Luis Muñoz challenges orthodoxy in how vocalastic holy grails are fundamentally signposted and he does so, almost always, with persuasive passion and genuine zeal. The high wire artistry of the vocalists is a fitting touchstone for this album. All in all, this is one of the most desirable vocal albums I have had the pleasure to listen to. Track List: Preludio y fin; Manantial; Argentina (vocal version); Journey of Saint Augustine (trio version); Pasión; Testamento/Mas Alla (vocal version); Amarilis (quartet version); Quisiera; Amanecer Luminoso. Personnel: Luis Muñoz: drums, percussion, keyboard and melodica; Ramses Araya: bongos and congas (1); Kevin Winard: percussion (5); Brendan Statom: acoustic bass (1, 3, 4, 7 & 8); Tom Etchart: electric bass (2) and acoustic bass (6); Randy Tico: bass (5); Adam Asanow: piano (1, 3, 5 & 9); George Friedenthal: piano (6); Jonathan Dane: trumpet (1, 4, 6, 7 & 8) and flugelhorn (3); Ron Kalina: chromatic harmonica (2 & 5); Narciso Sotomayor: electric guitars (2); Daniel Zimmerman: acoustic guitar (4 & 7); Chris Judge: acoustic guitar (5, 6 & 8); Magos Herrera: Lead vocals (1, 3, 6 & 9); Teka Penteriche: lead vocals (2, 5 & 8) and background vocals (2); Claudia Acuña: lead vocals (8); Lois Mahalia: background (2); Andy Zuñiga: background vocals (2); Jana Anderson: background vocals (5); Victor Martén: background vocals (5). "Multi-talented Luis Munoz, has channeled his production skills into a sublime direction on Voz"
Hailing from Brazil, Téka Penteriche is invited to vocalize on "Manantial," a dreamy yet rhythmic number, and goes back to her roots on the nimble samba "Pasion." It is a rare treat to have two outstanding singers on one song, which is the case when Penteriche joins Chilean songstress Claudia Acuna for the duet "Quisiera," a tragic tale of lost love, which hangs on the memory like an ancient song in a sad city. Much of the core group on the record have been with Muñoz since his 2013 release "Luz," which accounts for the cohesion in the instrumentals "Journey Of Saint Augustine,"—done in a trio format with Dane on trumpet, bassist Brendan Statom, and Daniel Zimmerman on acoustic guitar—and "Amarilis," a haunting tango with Muñoz on melodica joining the trio. THE FIRST REVIEW OF "VOZ" IS IN!!!!!!!!!!!
" A STUNNING PIECE OF MUSIC! . TEKA, MAGOS HERRERA AND CLAUDIA ACUNA SHINE ON THIS CAREFULLY CRAFTED MASTERPIECE!." Devon Wendell, The International Review of Music!!! Costa Rican composer and percussionist Luis Muňoz is one of the most vibrant and dedicated Latin jazz artists on the scene today. His new album VOZ is an obvious labor of love which fuses Brazilian jazz, and “crossover” pop. But there’s a refreshing purity about VOZ. Muňoz is joined by special guests: Claudia Acuňa, Magos Herrera, and Téka on vocals. “Preludio Y Fin” is a beautiful jazz ballad. Magos Herrera’s delicate and mournful vocal phrasing is complimented by Adam Asarnow’s thoughtful and masterful piano accompaniment. Jonathan Dane’s trumpet style here is reminiscent of Miles Davis’ finest ballad recordings of the late 1950s. Muňoz’s brush work on the drums is subtle and absolutely superb. A stunning piece of music. “Manantial” features the incomparable Téka, one of the most original and powerful vocalist/guitarists to come out of Brazil in many years. She is featured on both lead and backing vocals. Her breathy, sensual vocals glide beautifully atop of Ron Kalina’s chromatic harmonica lines. No one sounds like Téka. Muňoz’s sensitive drumming and colorful texturing on the Fender Rhodes piano adds depth and complexity to this “crossover” pop composition. “Argentina” was written by Nicaraguan lyricist Luis Enrique. Jonathan Dane’s Flugelhorn is melodically and harmonically complex. Magos Herrera’s vocals are poignant and plaintive. Brendan Statom’s acoustic bass lines weave in and out of the melody like a wonderful dream. Muňoz plays it cool, maintaining a mostly subordinate role in the overall band sound. This is a haunting piece of music but not as darkly stunning as the instrumental “Journey Into Saint Augustine.” Daniel Zimmerman’s acoustic guitar dances around Jonathan Dane’s muted flugelhorn phrasing, while Brendan Statom’s bass lines keep it all together. A lovely musical dance among three amazing musicians. “Pasiόn” was written by the great Panamanian lyricist Romulo Castro. No one can turn a phrase like Téka and this composition is further proof of her amazing skills. Téka’s longtime guitarist Chris Judge accompanies her every nuance perfectly. Ron Calina’s harmonica lines almost sound like a great alto-sax player. Trumpeter Jonathan Dane is one of the brightest stars on this album. His tone echoes Freddie Hubbard’s on “Testamento/Mas Alla” and Magos Herrera’s lead vocals are subdued, controlled, and full of melancholy. Most of the album has a sad and mournful feel to it. “Amarilis” will bring tears to your eyes. It’s just a quartet performance consisting of Jonathan Dane, trumpet, Luis Muňoz, melodica, Brendan Statom, bass, and Daniel Zimmerman, on acoustic guitar. Muňoz’s melodica playing is perfectly in tune (a rarity for this instrument) and tasteful. 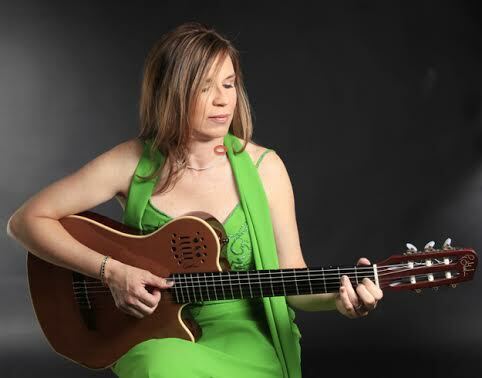 Téka’s rich vibrato and melodic phrasing on “Quisiera” (co-written by Jaime Gamboa) is the highlight of the entire album. Téka shares the lead vocal spot with Claudia Acuňa. Jonathan Dame’s trumpet follows every breathtaking twist and turn of the vocals with taste and purpose. Chris Judge’s guitar accompaniment is sweet and thematic. The album closes with “Amanecer Luminoso”, written by Costa Rican poet Osvaldo Sauma. This is a sweet but stark lullaby, a piano-vocal duo. Magos Herrera’s tender vocals are accompanied by some very subtle piano comping by Adam Asarmow. Luis Muňos’ VOZ is a beautifully pure album of some romantically dark and sincere Latin jazz at its best. Muňoz plays more of a background role, letting fantastic artists like Teka, Claudia Acuňa, and Magos Herrera shine on this carefully crafted masterpiece. Voz will be released on Sept. 15.